A study by an international group of mycologists, including Kathie Hodge in the SIPS Plant Pathology and Plant-Microbe Biology Section, has revealed the presence of behavior modifying alkaloids in fungi that infect and kill cicadas. 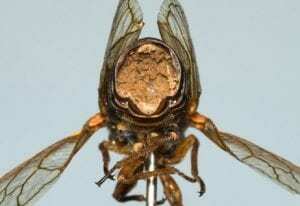 The researchers have demonstrated that a species in the genus Massospora, infecting periodical cicadas, produces the plant amphetamine cathinone, while two species infecting annual cicadas produce psilocybin. One of the manuscript coauthors, Angie Macias, received her B.S. at Cornell (Plant Sciences ’15) and is now a graduate student at West Virginia University in the program of Matthew Kasson, the study’s senior author. While at Cornell, Macias worked with Hodge at the CUP Herbarium and wrote an article on the Cornell Mushroom Blog, ‘Flying Salt Shakers of Death,’ that helped inspire Kasson’s investigation of this biological system. Though not yet published, the findings are generating significant interest in popular and social media as evidenced by a recent article in The Atlantic. The complete manuscript can be found on the preprint server BioRxiv.